For today’s Test Kitchen I’m experimenting with Asian black rice. I stumbled upon this at the Asian market and decided to challenge myself by using a ingredient I’ve never tastes or even seen before. I googled this mysterious rice and came upon just a few recipes..most were desserts. I can maybe get my family to eat this as a savory dish, but a sweetened black rice pudding??? Never!! Not satisfied with my search I decided to just be inspired by the ingredient and I invented this Asian Rice Salad. Its sweet, sour, nutty and a light side dish. Those brave enough to try it were pleasantly surprised and pleased! Soak rice in enough hot water to cover it for half hour. Place on a medium fire and cook for 40 mins. Add water as needed. Make sure the rice doesn’tabsorb all the water. After 40 mins take rice off fire and strain. Allow rice to cool completely. Place all ingredients for the marinade in a bowl and wish together. Add rice, carrots, green pepper, grape tomatoes and chopped cranberries. Mix well. Add the Almonds just before serving. This salad can be eaten immediately. It looks as though you met your challenge and passed it with flying colors. This looks delicious. The dressing sounds so flavorful. Great flavors and textures in this dish. We bet it was good. hi! 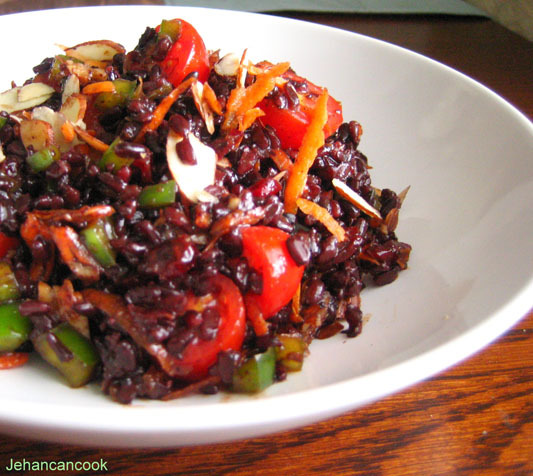 ive tried black rice before as a dessert, but this salad looks interesting! now, come to think of it i think i did take pictures of that black rice dessert but never got around to posting it! That is absolutely gorgeous! I’ve never had black rice, now I’ll have to try it. That’s a gorgeous recipe and my husband is a big fan of rice! I will try it for sure! Very creative recipe and the photos look simply great. That looks good! I have been wanting to try black rice. oooooh! I’m going to try this and i’m sure Kayla will love it. Will this stain my teeth? lol..I will have to look into that, but teeth are resilient and will likely survive this meal! Did you find out if it will stain your teeth? Looks delicious. 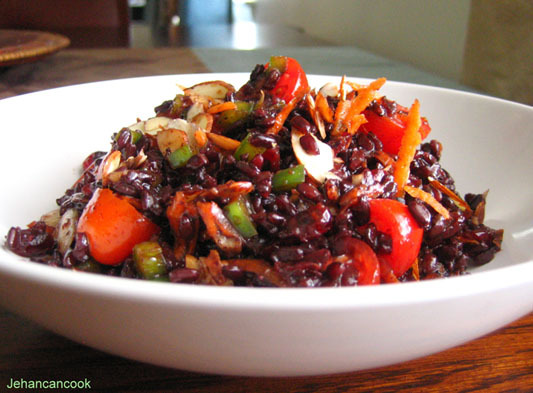 Did you know that this exact recipe is on a black rice site? 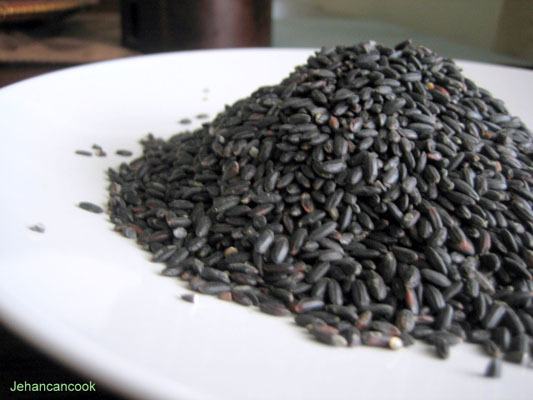 I had eaten black rice before and was looking for recipes. I found the black rice site, which had some. Then I came to your site and they had your recipe! The execution of the recipe is a little different, but the ingredients are the same. I hope you got some compensation for your recipe! Rainie, I had no clue! Do you remember the website?